Being a coffee lover is becoming a lot easier these days in Astoria, as we have lots of excellent options and tasty newcomers such as 60 Beans, Astoria Coffee, OK Cafe and others. However, in this post, I shine a light on other coffee roasters who happen to be located across the pond so to speak - in that other state we call New Jersey. While visiting friends Jessica and Ari in Asbury Park this summer, we happened upon some amazing coffee, which was both surprising and wonderful. Gravitating to the cold brew, as it's more unique and reminds us of the fabulous Stumptown cold brew we purchase sometimes, we tried two great options which I'll highlight here and one of which we're still drinking at home. 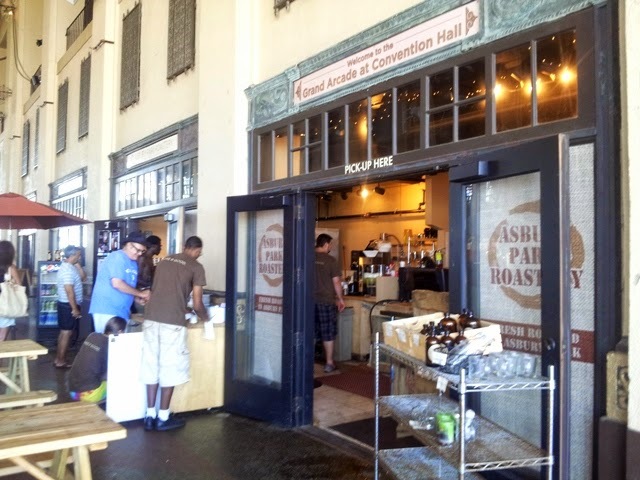 Asbury Park Roastery - Located in the historic Asbury Park Convention Hall that dates back to the 1920's, this roastery boasts a lot of charm and a fantastic smell that emanates from its doors. Seeing that they sold a 32 oz version of their cold brew made me stop in and buy some so Dan and I can enjoy it the following week. Rook - First trying this coffee at Jess and Ari's house, we couldn't stop ooohing and aaahing about how great it was. As the bottle shows, this is New Orleans Style Cold Brew, containing chicory, which adds a hint of natural sweetness and a delicious caramel flavor that's ever so subtle. Since it's mixed in with dark coffee, just like APR's cold brew, it's very potent and a little goes a long way. Similar to the APR concentrate, you need lots of milk to dilute this baby, but all that extra moo juice is totally worth it. My friend Angela recently bought me a fresh supply of this and we couldn't be happier. So, in terms of a cold brew coffee battle, I think you can assume the winner here (congrats Rook), although both are quality options that any staunch coffee lover wouldn't turn their nose from.